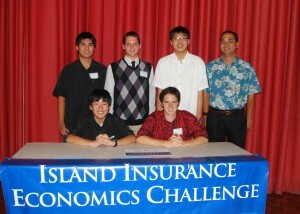 High school teams from Iolani School each claimed division titles in the 2012 Island Insurance Companies Economics Challenge. Hosted by the Hawaii Council on Economic Education on Wednesday, April 4, 2012 at the University of Hawaii Campus Center Ballroom, the spirited competition featured nearly 175 registered students from Hawaii private and public high schools, showcasing Hawaii’s outstanding high school economics students. 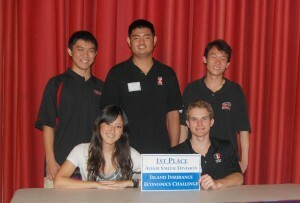 The Iolani students won both the David Ricardo division and the Adam Smith division. Maryknoll, Mililani and Kamehameha School – Kapalama were the other finalists in the David Ricardo division. Maryknoll and Kamehemeha School – Kapalama were the other finalists in the Adam Smith division. Reigning national champion Iolani claimed the Adam Smith division title for the 14th consecutive year. Iolani will represent Hawaii in a regional competition with regional winners moving on to the national finals in New York, May 19 and 20. The winners of the Adam Smith division were Iolani students: Connor Buckland, Stratford Goto, Aaron Nojima, Kirsten Peterson and Steven Yee. Winners for the David Ricardo division were Iolani students: Jack Gregory, Kenneth Lee, Evan Lum, Shane Hayakawa and Ross Villiger. “In a survey of Hawaii’s students, many did not understand current economic principles and concepts,” said Council Executive Director, Toni Takeno. “Students at this caliber deserve special recognition because they are challenging the current statistics,” she added. During initial rounds of the competition, students tackled fun and challenging written tests of their economic understanding and reasoning ability. The final rounds of the Economics Challenge involved a “first-to-the-buzzer” lightning-fast “Jeopardy Style” format as teams answered questions on complex economic concepts and theories involving micro- and macro-economics, international economics, and current events. “The knowledge and poise under pressure displayed by all participants were truly impressive,” said James Dixon, Assistant Vice President – Compliance and Governmental Affairs. “Their exceptional performances show that Hawaii has many outstanding future economic leaders,” he added. The Hawaii Council on Economic Education promotes the teaching of economics in Hawaii’s public and private schools to increase the economic and financial literacy of Hawaii students and residents. The Council’s programs promote economic literacy and focus on the development of successful strategies for improving the quality of economic education.